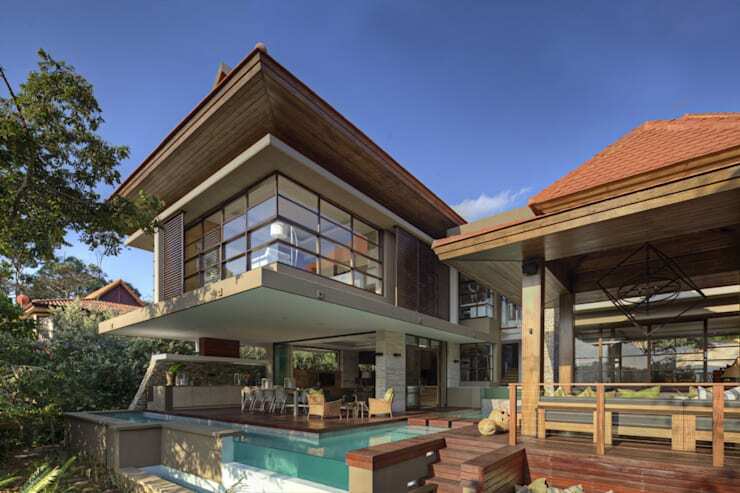 Welcome to the holiday town of Ballito, located in Kwa Zulu – Natal in South Africa. 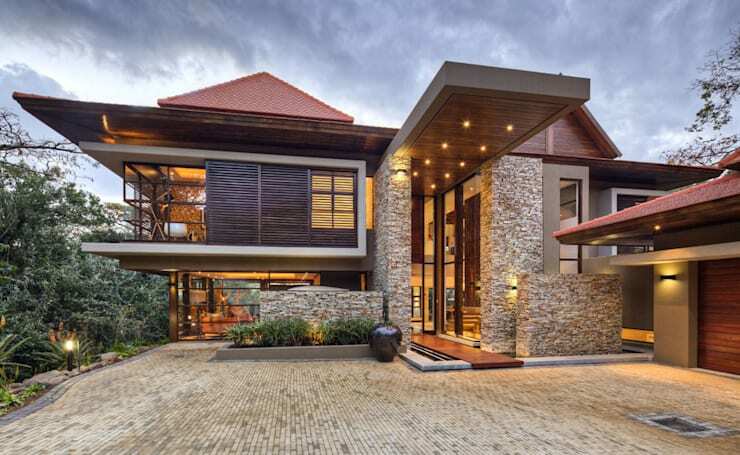 It has attracted our attention today with the lavish and stunning SGNW House constructed in the middle of the Zimbali forest, a home which inspires both from the outside as well as the inside. 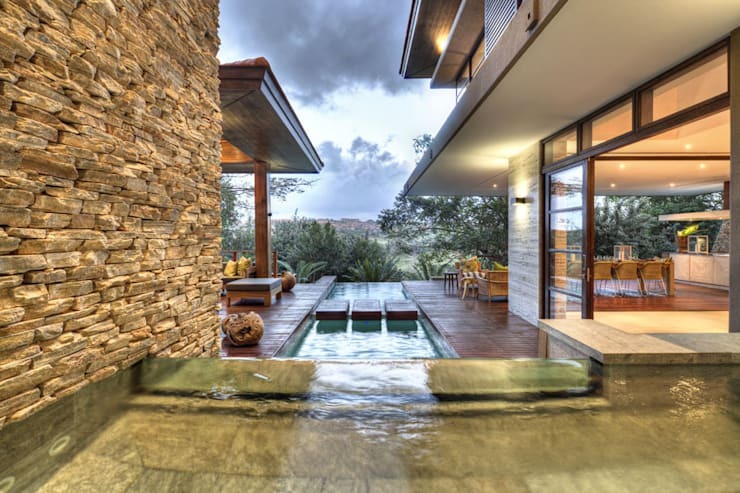 Rendered with varying materials like stone, wood, glass, and concrete, the magnificent residence enjoys a Zen-like calm owing to the multiple water bodies that unite to flow through the house and outside into the backyard pool. Generous use of glass allows inhabitants to enjoy nature’s beauty from different corners of the villa, while trendy accents and sober hues come together for a luxurious and cozy ambiance. With an opulent poolside, a charming gazebo, gleaming surfaces and gorgeous lights, this creation by the architects at Metropole Architects is like an awe-inspiring dream. Rendered with stones, concrete, wood and glass, the facade of the house is a stunning masterpiece. On the left, the bedroom floor on the upper storey juts out over the patio, and the roof flaunts a quirky, angular look too. The linear projection over the main entrance is a unique feature too, and is decked with recessed lights which cast a soothing glow. The approach of the abode takes us along a cosy wooden walkway which is flanked by a private stream that continues inside the home too. The water feature adds a unique sense of tranquillity to the space, while generous use of glass enhances the feeling of openness. 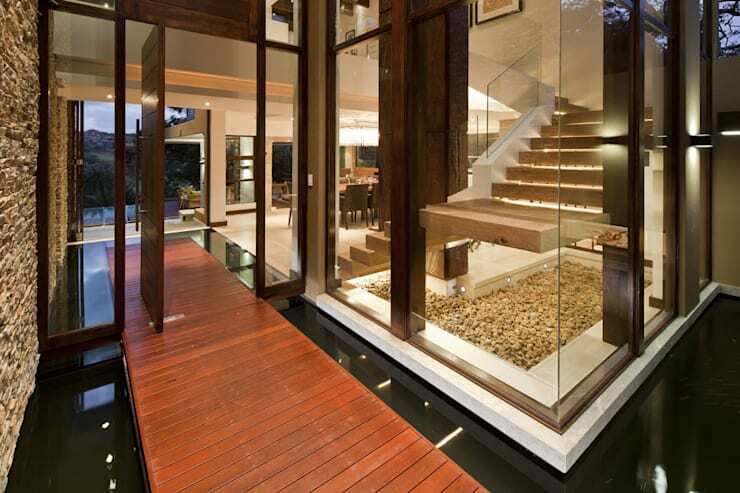 You can also catch a glimpse of a pebbled bed inside which complements the wooden frames, door and walkway elegantly. 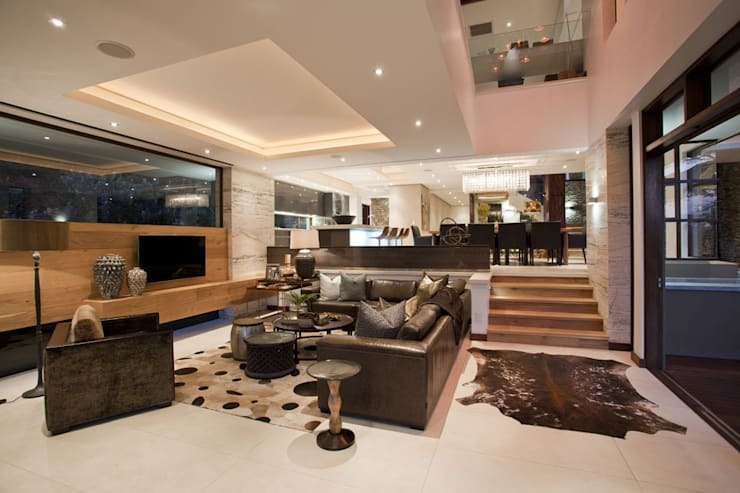 White, brown, beige and wooden hues dominate this ultramodern yet earthy living area, which is flanked by glass accents on either side for an expansive look and feel. The sleek but plush furnishing, the faux animal rug, the arty coffee tables, and the pretty vases and lamps all come together for a luxurious and stylish aura. 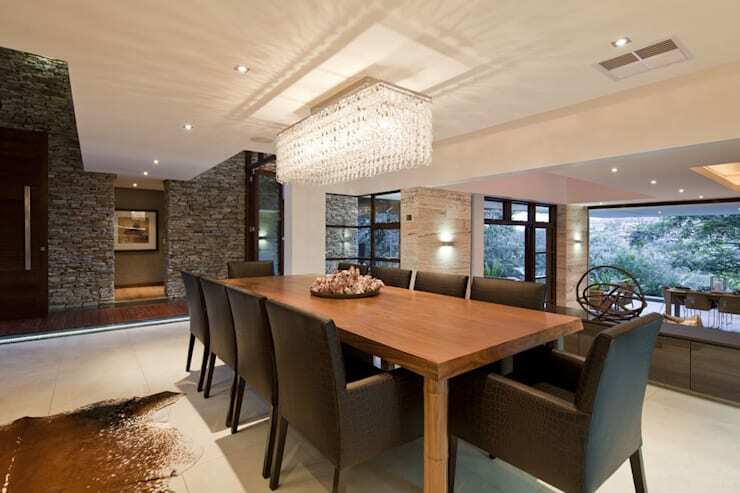 A sleek wooden table surrounded by modish grey chairs offers comfy and sophisticated seating in the dining space. The glamorous chandelier adds panache to the area, while the grey stone walls in the distance add a dollop of rustic charm here. 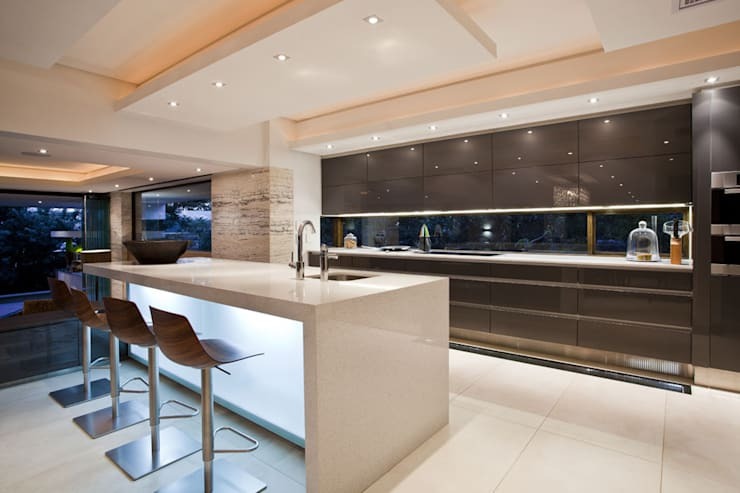 Smooth and gleaming surfaces pair with white and dark grey hues for a minimalistic and trendy look in the open kitchen. The island has been charmingly illuminated from within, and is accompanied by stylish bar chairs for those times when you want to grab a quick bite. Sleek cabinets offer ample space for storage, while the recessed lights on the false ceiling make for an inviting ambiance. The smart and chic home office has been positioned right next to the clear glass balustrade, and looks stunning with its gleaming white desk and futuristic black and chrome chairs. The shiny copper globular lamps form a unique lighting device, while the wooden beams, the stone walls visible through the glass windows, and the painted deer head on the left add natural charm to the space. The lavish use of clear glass panes set in slim wooden frames allows the spacious master bedroom to enjoy a stunning view of the forest outdoors. The colour palette here is an aesthetic mix of cream, white and beige hues, while plush furnishing promises oodles of comfort and rest. 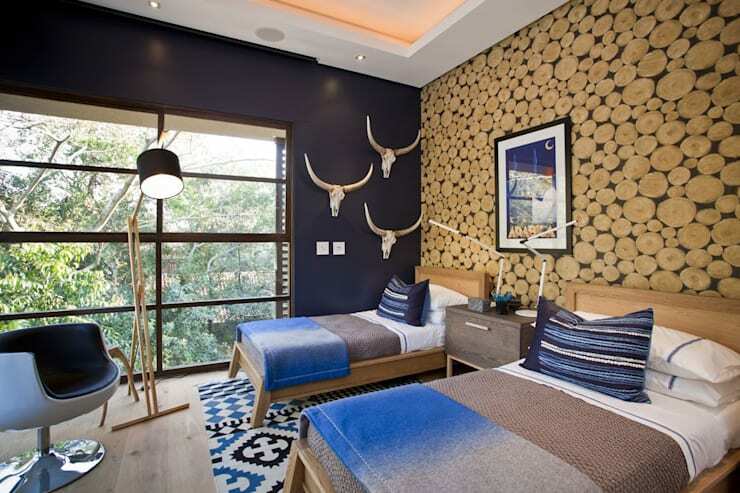 Splashes of different shades of blue rule the bedroom for kids, and trendy pattern play adorns the rug and the pillows. The wall behind the beds is an exquisite work of creativity, with thin cross sections of tree trunks lining it for organic appeal. A vibrant artwork, animal heads, a quirky armchair and an unusual standalone lamp complete the peaceful yet exciting atmosphere here. The large window is a plus and it allows you to soak in the beauty of nature effortlessly. A large, airy and sunny deck lined with wood looks over the pristine blue pool in the backyard. The luxurious pool comes with a glass edge, and is perfect for unwinding with a cool drink or taking a few laps to feel rejuvenated. 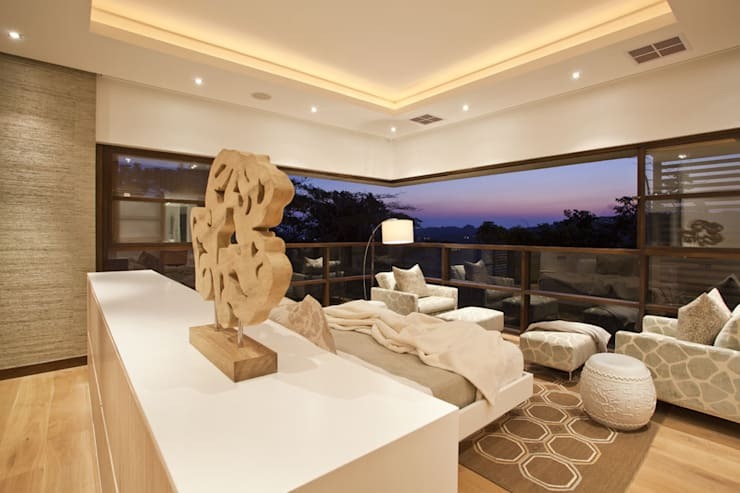 We are impressed by how water plays the leading role in the design and decor of this property. The internal stream you saw while entering the home, flows around the interiors and finally ends in the pool. Helped by elements like wood, glass and stone, this water helps in creating a Zen-like calm wherever it goes. 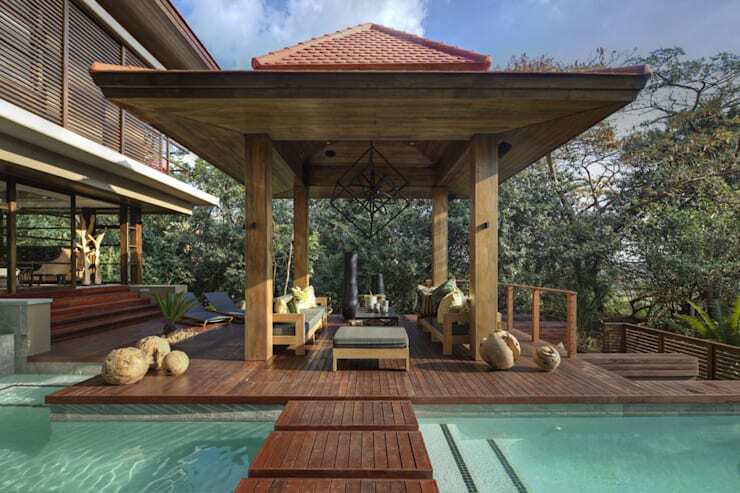 Chic, floating wooden steps lead you from the poolside to the remarkable gazebo, which is adorned with pretty organic artefacts and cosy furniture. Solid wooden pillars support the structure, while stylish red shingles line the peaked roof for a quaint effect. Surrounded by lush greenery and soothing waters, the gazebo allows you to relax with friends and relish sheer serenity. This fascinating property left us awed with its heady mix of natural elements, water features, unique decor schemes and a gazebo that simply stuns. Check out another tour for more ideas - A Stunning Home For The Style Conscious.